Introduced on Construction Day 2009, and probably only available on that day (and perhaps future construction days). Some people think it may be possible to still get it when repairing guild invasion damage. 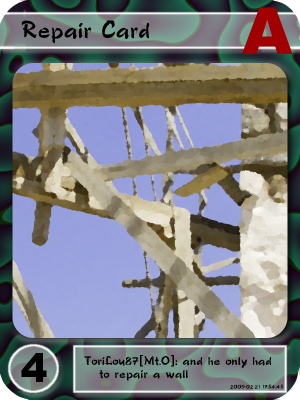 However we don't know of anybody who has claimed to have got a card in this way, and game mechanics suggest that it won't happen – repairing a guild building is exactly the same process as constructing one.